A few months ago, Chief Kelvin Cochran thought he had his future pretty much mapped out. As first vice president of the IAFC, he was due to assume the top role this summer. Next year, he planned to retire as chief of the Shreveport, La., Fire Department and secure a high-level post with the USFA or FEMA. But sometimes opportunities come around that you're just not expecting — like being offered the job of chief of the Atlanta Fire Department. "A lot of people spend their whole career preparing to compete for a job like this, and to actually be sought out for the position is a tremendous honor," said Cochran, who was officially appointed to the post last month. Since becoming the chief of the Shreveport F.D. in 1999, Cochran has become one of the most respected leaders around. Though soft spoken, he delivers his words with a power and conviction that department members can't help but take notice of. It was these qualities that led Atlanta officials to seek out the Louisiana native to replace Dennis Rubin, who left to become the chief of Washington, D.C. But initially at least, Cochran was given the impression he'd be helping them to find a new department head rather than be that person. His initial contact with the department came last fall, when they called to ask if he would serve on a panel to interview candidates. However, previous commitments meant he was unable to help, so they instead asked if he could participate in a conference call to review the finalists at a later date. "Six weeks later, I received a call from them and I thought it would be to set up the conference call," Cochran said. "But instead, they asked me if I would be interested in the position myself. "To be honest, I was shocked, intrigued and infatuated." The shock was understandable; Cochran already had the next few years planned, first as the president of the IAFC, then in an as yet undetermined federal-level role. The intrigue and infatuation came from being offered the top role within a major fire department. "At the time, I really didn't think I would be interested in being fire chief anywhere else than Shreveport," Cochran said. "But the city of Atlanta has significant opportunities and significant challenges that a fire service leader just couldn't pass up." The most significant challenge, Cochran said, is the city's current budget shortfall of about $70 million, set to rise to $100 million next year. It had led city officials to ask each department to look for ways they can cut spending by up to 25 percent for next year's budget. Having been in the job just a matter of weeks, Cochran said he had been hoping for the opposite. "When you're the new guy, you usually get money almost thrown at you for new initiatives and to create some excitement," he said. "But I won't have that." Local EMS provider Grady Hospital is also suffering financial trouble, so much so that it is proposing to end its ALS transport service this summer. Cochran has spent significant time helping to put together strategic options as to who can take over the transportation service, including the possibility of Atlanta Fire Rescue taking over the service for the city. Despite these issues faced so early on his new role, Cochran is relishing working at the new department. 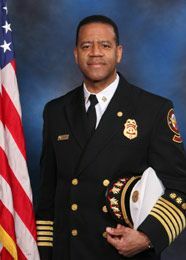 Previously, he was a 26-year-veteran of Shreveport, having joined as firefighter in 1981, progressing through the ranks of training officer and assistant chief training officer before becoming fire chief in 1999. Without regular drills to maintain survival skills, those skills are not going to be as sharp as they need to be . His company officer background makes him a passionate advocate of firefighter safety, which, he said, must be led from the top down. During his time as Shreveport's chief, the department suffered no major injuries or line-of-duty deaths. Cochran is a highly regarded speaker on safety at industry conferences, and he cites the safety culture as one of the most significant issues in the fire service today. "Even though firefighters do not willfully and intentionally commit themselves to acts that will get them seriously injured or killed, nonetheless LODDs are an all-too-frequent occurrence," he said. "I think it's directly related to the culture of fire safety in the firehouse. There are basic firefighter safety processes that are getting firefighters killed, like not wearing seat belts." Not enough company officers, he said, are setting a good example by buckling up themselves, nor are they making sure others in the truck are wearing seat belts every time they roll out of the station. The training culture that currently exists also leaves a lot to be desired, according to Cochran. Things like Shared-air emergency methods — buddy breathing — are simply not drilled enough in too many departments, he said. "It's one of those skills that is mastered during recruit academy but is hardly ever used once they get out," Cochran said, "but without regular drills to maintain survival skills, those skills are not going to be as sharp as they need to be when a firefighter is actually in survival mode." "The job of a company officer is to maintain those basic firefighter skills and survival skills. But by and large, most company-level officers are not willing to do that." As well as the absence of major injuries or LODDs, Cochran has much to be proud of from his time as chief at Shreveport. Firefighter pay rose by 36 percent and firefighter staffing levels increased across the board. He'll also be remembered for leading his department's efforts in helping the New Orleans Fire Department respond to the devastation caused by Hurricane Katrina in 2005. "The city of Shreveport was the first organized fire response to be able to assist them after the storm went through," Cochran said. "That was something we were very proud of." The biggest issue for us during that operation was dealing with the territorialism that existed between state, local and federal levels . Issues surrounding the general response — at federal, state and local levels — to the disaster are well documented, and Cochran is keen to ensure lessons are learned. "I learned that at times like that," he said, "you can't allow the policies of state or federal operations to stand in the way of responding to meeting the community needs." His firsthand experience gives him a good position from which to advise departments and chiefs facing similar challenges in the future and to outline the potential pitfalls. There are "three Cs," he said, that should be adhered to: communication, coordination and cooperation. As for communication, "there needs to be an organizational structure established pre-incident, especially those incidents when you can forecast a disaster and know when it's going to hit," he said. The lines of authority, divisions of labor and the chain of command need to be clear, Cochran said. Once this is done, coordination comes into play: "There needs to be a level of trust and reliance on each division of labor to do their part and communicate what they are doing throughout the organizational chart," Cochran said. Finally, there is the issue of cooperation, something that Cochran calls the "disaster behind the disaster of Katrina." "The biggest issue for us during that operation was dealing with the territorialism that existed between state, local and federal levels," he said. "All the issues were associated with who was getting the credit for the good things that were going on and who was getting the blame for the things that were not going right." As for Cochran's future, he still harbors some hope of becoming the IAFC president further down the line. Upon accepting the Atlanta job, he resigned from his first vice president post with the union. When a chief becomes the president, which Cochran was in line to do, his department effectively loans him to the organization for the year. By the time of Cochran's scheduled appointment to the job in August, he would only have had been chief of Atlanta for a matter of months. Current IAFC President Steven Westermann expressed his disappointment at losing such an "incredible leader." "But as a new fire chief in a city, it just wouldn't have worked at this time," Cochran said. "That's not to say, however, that in three or four years from now, once things have been established here, that I might not go after it again."